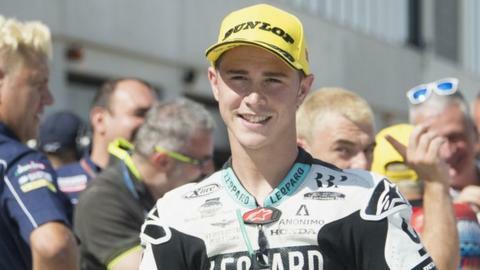 Danny Kent is hoping to enter the record books and emulate motor racing great Barry Sheene in Japan on Sunday. Kent, from Chippenham, could lift the Moto3 Championship title this weekend and be the first able-bodied British world champion since Sheene in 1977. The 21-year-old Leopard Racing rider is 55 points ahead of closest rival Enea Bastianini with four races remaining. "Being the first British champion since Sheene, of course I have to have it in mind," Kent told BBC Wiltshire. If Kent wins in Motegi on Sunday and Bastianini fails to score any points, the Briton will be crowned champion. Sheene, who died in 2003, was the last British rider to claim a title when he captured the main MotoGP Championship 38 years ago. Failing that, his next chance to secure the title will be in Australia on 18 October. "It is a dream for any rider - it would do wonders for my career," Kent said. "We need to keep working hard and hopefully we can clinch that title as soon as possible."